This post was co-authored by Nilay Shah, Engineer, Azure Backup Product Group. Azure Backup provides cloud-first solution to backup VMs running in Azure and on-premises. You can backup Azure Windows VMs with application-consistency and Azure Linux VMs with file-system consistency without the need to shutdown virtual machines using enterprise level policy management. It provides backup support for encrypted virtual machines, VMs running on Premium storage, and on Managed Disks. You can restore a full VM or disks and use them to create a customized VM, or get individual files from VM backup using Instant File recovery. Azure Templates provide a way for provisioning resources using declarative templates. These templates can be deployed using Azure Portal or PowerShell. You can get started with backing up and protecting your VMs running in Azure using these templates. 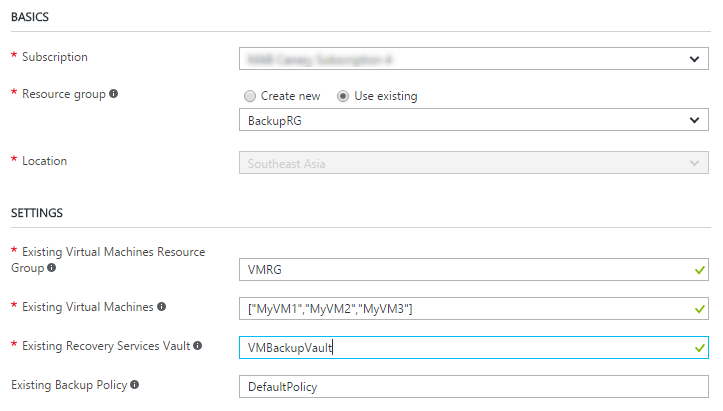 In this blog post, we will explore how to create a Recovery Services vault, a backup policy, and use them to backup set of VMs using vault and policy created using templates. Recovery Services vault is an Azure resource, used by Azure Backup and Azure Site Recovery to provide Backup and Disaster Recovery capabilities for workloads running either on-premises or in Azure. 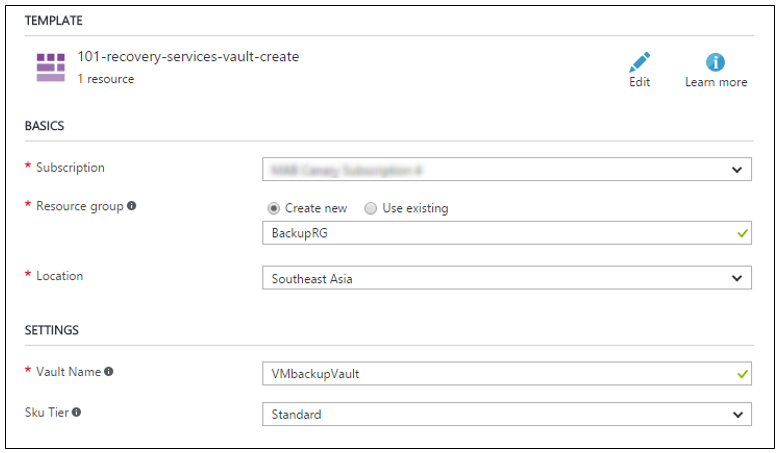 To create Recovery Services vault, we can use an Azure quick start template called Create Recovery Services vault. By default every Recovery Services vault created comes with a default policy. This policy has a daily backup schedule and retains backup copies for 30 days. You can use this policy to backup VMs or create a custom backup policy. If you want to create a custom policy, you can combine vault creation and policy creation using a single quick start template based on the your organizational requirement of Weekly Backup schedule or Daily Backup schedule. Recovery Services vault is used to store backups for multiple VMs belonging to different resource groups. You can configure classic, as well as Resource Manager VMs, to be backed up in a Recovery Services vault using the quick start template, Backup Classic and Resource Manager VMs. Most of the enterprises deploy their application specific VMs to a single resource group and you can back them up to a vault, belonging to the same resource group as VMs or to a different group using the simple quick start template, Backups VMs to Recovery Services vault. Please be sure to check out Azure Backup best practices to optimally deploy VMs to a backup policy. Once configured for backup, you can restore or take an on-demand backup of backed up VMs using Portal or PowerShell.